Kewl Design Alert: Rotating Wall Outlets Exist?! Gadgets and their plugs: there always seems to be some combination of those plugged into the outlet that's smack dab in the middle of the kitchen. And when hubby, the Dude and I are all vying to charge something we need to bring with us in the morning, we usually head to that particular outlet. Which means we can end up trying to Tetris a couple of giant bulky chargers together into a standard outlet. 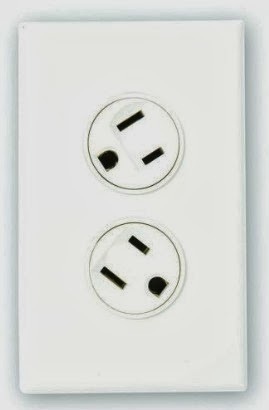 Now, I've mentioned before that, had we thought about it, we would have opted for some of these handy USB outlets when we were first wiring and painting the house. But alas, we discovered them too late. Of course, there were these handy USB power bars, which could permit charging a few phones off the same outlet (along with a couple of other standard plugs. Very, very handy. And now, I just learned that Home Depot carries these rotating plugs. (Before you ask, they're not like the baby-proof ones which misalign the cover and the actual outlet openings until you rotate them.) This has a mechanism that rotates 360 degrees so you can rotate the outlet to fit a couple of awkwardly sized plugs.